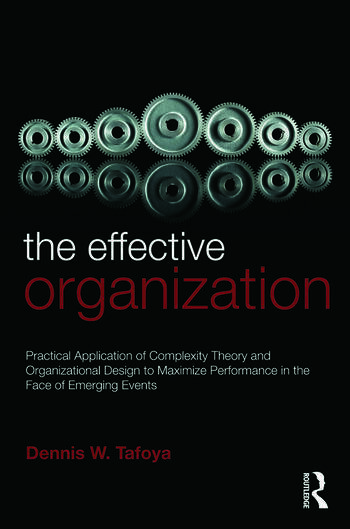 The Effective Organization: Practical Application of Complexity Theory and Organizational Design to Maximize Performance in the Face of Emerging Events. Performance is the reason why organizations exist. Through performance organizations meet the needs of internal and external stakeholders as defined by their mission, goals and objectives. This is true for all organizations. If a retailer won't stock goods a customer wants, the customer will shop elsewhere. If a religious organization does not meet the needs of its followers, they leave. If a cult doesn't meet the needs of its memberships they seek their goal fulfillment elsewhere. If a manufacturing center can't produce goods that meet customer standards, the customer will reject it. Complexity theory, a tool used to examine the nature of dynamic systems like organizations, can contribute to our understanding of organizations and ways to improve their performance. The models and material outlined in the book illustrate ways competency and organizational programs, processes and procedures are used to manage emerging risks, threats and vulnerabilities that challenge today's organizations. Collectively this information enables the identification of individual organization profiles as a way to advance our understanding of an important theory, complexity, in an applied setting -- organizations. Unique typologies describing organizations (four types), events that effect organizations (six types) and the fundamental structure for organizations are presented to enable the forecasting of an organization's capacity to manage different events as they emerge and how behavior organizes around these events. Academicians studying organizations and practitioners interested in improving them can use this information to facilitate baseline, descriptive thinking and analysis or more sophisticated examinations aimed at understanding the dynamic nature of organizations as fully functioning systems. At the heart of the effort is the examination of what it takes to get the performance needed to achieve a vision or mission and why, despite planning, training and evaluation, few organizations can guarantee or maintain desired levels of performance when faced with events, routine to extreme, that shape their existence. Particular emphasis is placed on understanding how knowledge, evaluation, information and, communication management practices need to be tailored to fit particular organizations rather than treated as a "one size fits all" approach. These are not limited, theoretical discussions but are presented as ways to efficiently talk about an individual organization's profile or competencies within a class of, or in contrast to, other organizations. Dennis W. Tafoya (Ph.D., University of Michigan; M.S., University of Pennsylvania) is President of CompCite, a research organization located in Devon, Pennsylvania. He has more than 35 years of teaching and research experience in business, government and university settings. His current projects examine the design and use of strategic operational practices and the quantification of performance across different settings.